Personalize as an individual gift or as a participation gift for your next lacrosse tournament! lapel pins are for collecting and trading. 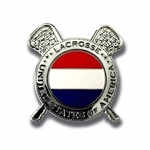 Minilacrosse has lapel pins in stock and will also make custom and personalized lacrosse lapel pins. Where can i get more information about lapel pins?